For my second design this week, I am revisiting a design by Gnarly Gnails. We have seen a lot of girls come and go in the group, and I do miss them, but I really miss Gnarly Gnails. I loved the designs she came up with, they were always so cool! I had to pay homage to this amazing lady and I did it by recreating her gorgeous skittle lace design. I tried to match the colors but I was lacking all but one. I did my best but I realize that they are not perfect. I wish I had used a darker army green on my ring finger. I used OPI Pepe's Purple Passion, Catrice Hip Queens Wear Blue Jeans, Catrice Khaki Perry and butterLONDON Two Fingered Salute. I got out the acrylic white again to create the lace design. This was my first time freehanding lace. I like and I don't like it. I wish my lines were a bit cleaner, but it is not bad for my first attempt! I need a much thinner brush. 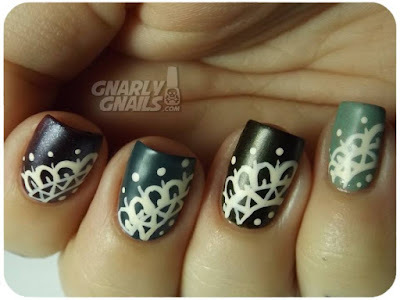 What a beautiful mani!!! This Buttwer London is so gorgeous!! Great job recreating her manicure! Miss you too so much Gnarly Nails, very particularly during Digit-al Dozen. I think often of you. And you Katee, thank you so much to honor her with this beautiful nail art.